I'm not sure how I feel about this book. I didn't love it, but I also enjoyed it a lot at times. A lot of times I found it a bit boring, but I also wanted to know what would happen next. I didn't fully love the writing, but I liked it. I think I connected with the characters. Probably. I loved the time period, but also wished it had been a bit later; as not that much happened. 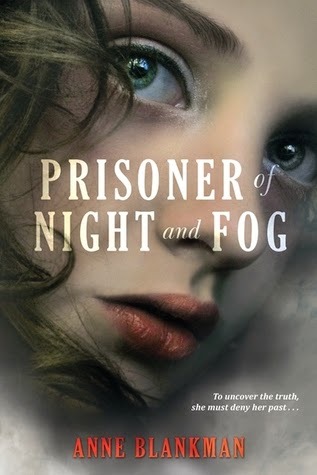 The title is Prisoner of Night and Fog. And now that I think of it, I kind of imagined the main character to be a prisoner of sorts. Which she wasn't. Sure, a few awful things happens to her. But I also felt like she could leave at any moment. Which she didn't. But I must also admit to liking Gretchen. Though she did do a few things that I did not approve of. Nor do myself. This book is told from the point of view of Gretchen. Like I said, I liked her sometimes. We learn a lot about her; about how her dad died protecting Adolf Hitler, her Uncle Dolf. Which I found to be the silliest name ever, to be honest. Didn't like when it was mentioned. Sigh. But anyway. We also learn a lot about her brother. Whom I could not stand at all. He was just pure evil. And so mean. But he was also interesting to read about. I just. If someone killed my cat, I would do something about it. I would not let him get away with it. I felt like Gretchen didn't do the things I wanted her to do in this book. Sigh. I won't say too much about this book, as there isn't all that much to say for me. I liked it, but didn't love it. Which is why I'm rating it with a three star. But I'm also very glad that I read it. I enjoy reading about war-times. Though there wasn't any war in this book. And I wish there had been. Which is a bit strange, I guess. I wish the book had been in the years when Hitler did the even worse stuff. And not just years (?) before, when he wasn't all that awful. But I still hated him in this book. I found him to be creepy. I must admit to not having read much and Germany and that time and the Jew. I don't know much at all. I know the important things. I know that tons of innocent people died. And they died a horrible death. Which makes me all kinds of sad and ragey. But I also wanted to read about that in this book. But there weren't anything about that yet. Which is probably why I didn't fully love it. Which might be beyond weird of me, but I like reading about awful things that break my heart. Wasn't enough of that in this book. Anyway. There is a lot of things happening in this book. Despite the fact that I found it a bit boring a few times, I also thought it was interesting and exciting. A lot of things were obvious to me, and it pissed me off a little that Gretchen didn't see things right away. Agh. But yeah. I liked the plot in this book. Though there were too many names. Which annoyed me. Can't remember any of them, or the characters :p But I did enjoy reading about a few of Gretchen's friends. Though I disliked Eva a lot. Agh. I didn't always approve of the things Gretchen did. I didn't approve of her relationship with Uncle Dolf. I didn't like him at all. And she adores him in the beginning. And I disliked her mom so much. She was just.. a coward, to be honest. And her brother. He did so many awful things. Beyond awful things. Though a few times I didn't care at all.. but it was interesting to read about and it was pretty sad. But anyway. I did enjoy this book. Though I do wish it had been a little bit more. But I liked the time period. There is a romance in this book. And I enjoyed the romance. I wish it had been more, but it is also very sweet. I think Daniel was an amazing character. And I loved getting to know him. Though I do wish I had gotten to know even more. Hmm. And I do wish he and Gretchen would have gotten more quiet moments together. <3 But anyway. I thought their romance was sweet. It wasn't perfect, but I liked reading about it. It is also forbidden. Which I enjoyed, but didn't love. But it was very interesting. I'm so very intrigued about this book and I cannot wait for my preorder to download! And I'm glad to hear that you liked it enough to recommend it even if you didn't totally love it! I know this one must have been a hard one to read, because I'm sure a lot of really horrible things happen. But it does sounds like an intriguing story and I'm glad you ended up enjoying it for the most part! I think I read that in the sequel there's a time jump, and it takes place just after Hitler gets full control over Germany--pretty sure it'll follow the same characters! I'd imagine that means we'll get to see a lot more of the brutal things the Nazi regime did to the Jews then. Ack, yes, me too. He was just so evil!